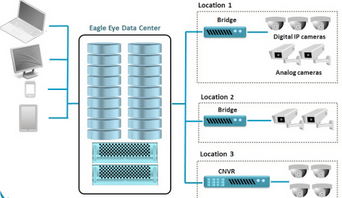 Just yesterday Eagle announced that their first “Video Surveillance Report” would now be available to the public. The report analyzed the responses of 250-500 IT professionals regarding topics like: video surveillance systems, cloud video surveillance, IT’s role in video surveillance, and view of video surveillance system vulnerability. Eagle Eye is becoming the one stop shop for industry announcements. Some of the findings that will be included in the report are: business plans for video surveillance, cloud surveillance, top drivers for cloud, top hurdles to cloud and top frustrations with current systems. The results of each survey are available now. The Eagle Eye Network is the first on-demand cloud based security and operations video management system that allows customers to have both cloud and home recording.